A case study with Pablo Avengo, MBA, IT Manager from Argentine-based manufacturing company Ventalum S.A.I.C. In this case study Pablo shares the experience of Ventalum on implementing the business scorecard. The project was initiated with Excel as an automation software, which soon was recognized as not being suitable for the purposes of the company’s scorecard. 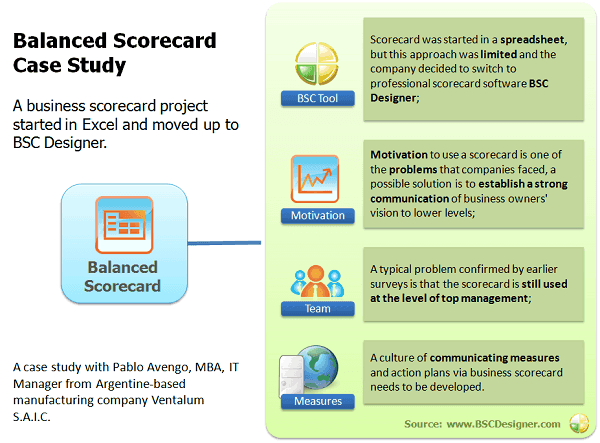 As a result, the company decided to replace a business scorecard in Excel with a scorecard in BSC Designer. Pablo believes that strong communication from top managers is half the battle in the motivation of employees for building a measures-driven company. Ventalum S.A.I.C. was created in 1966 and it is an Argentina-based company, a manufacturer of products from extruded section of aluminum and glass. The company is a supplier to the main manufacturers of items in the automobile and transportation industry in Argentina. The Balanced Scorecard project was started in June 2013. Before this there was not a formalized culture of measurement in Ventalum. Things have changed since the introduction of new management initiatives that suggested implementing a formalized measurement system that would allow the company to become better with time. Now, Ventalum has basic indicators and is focusing on improving their values over time. What obstacles did Ventalum face? Ventalum’s business scorecard consists of 20 KPIs, which were entered manually on a monthly basis. Mainly, these KPIs are responsible for the efficiency part of production. These KPIs are aligned with a strategic objective of costs reduction. In the production process there are much more operation measures, but Ventalum wanted to have on their business scorecard only strategic and top-level operational indicators. Human Resource indicators such as “absenteeism” shows the number of people present and absent. “We were using MS Excel for an automation of a business scorecard, but we found out that the usage of Excel spreadsheets that we keep on a local disk were short and too limited for our needs. That’s why we decided to use BSC Designer to replace Excel in our monthly Balanced Scorecard process. For now, in a spreadsheet we have our most important measures from September to December. Most of these indicators refer to operative aspects, such as workforce efficiency, materials efficiency, absenteeism, and accidents. Ventalum start exploring functions of BSC Designer. Besides main functionality, a company found the Excel report very useful. Stakeholders of a company use the “Business Analysis” tab to find out the best and underperforming indicators and can decide what indicator requires immediate attention right now. The Balanced Scorecard in Ventalum is used primary by business owners. Business owners have full access to the business scorecard and KPIs. They review information at the beginning of the month and provide their feedback in the form of an action plan to other managers. These initiatives are aimed at getting better results from business. Top managers are not using Balanced Scorecard yet, but they are encouraged to use it to be able to start the improvement process. Line managers for now are not accustomed to using metrics or communicating them to the rest of the team. IT specialists help to get all indicators from business systems and enter them into a business scorecard. Line-level employees don’t interact with a business scorecard system yet. Pablo, thank you very much for participating in a case study. I believe that for any company that starts its balanced/business scorecard project it would be interesting to learn from your experience. Obviously, your decision to switch from Excel is on time. According to what other users shared with us, a spreadsheets approach for a scorecard works fine on the test stage, but when more indicators and business objectives are added into the scorecard, a company need to switch to a professional scorecard software, which in your case was BSC Designer. With a strategy map function of BSC Designer you can visually present your top level business goals (like cost cutting that you mentioned) and show how they are linked to lower level objectives in other perspectives. The most important indicators from your business scorecard can be displayed on dashboards. You can easily create an HTML Dashboard Report that you can regularly send to line-level employees and share a big picture of how things are going in the company with them in this way. It was confirmed by many users that this approach works and helps to focus employees on achieving objectives that are important. As for involvement of managers and line-employees, a recent survey showed that this is a typical problem that can be solved by switching to professional scorecard software and treating the scorecard like a management issue, not just a measurement tool.